Who wouldn’t love a trip to Germany? Culture as far as the eye can see, history that’ll make your bones rattle, and of course, the Autobahn. But an important thing to consider while you plan your trip wrapping around the many mountainous roads and that unforgettable hyperspeed highway is whether or not you have the right tools for the job. However, are the right tools only available in Germany, or are they right under your nose in America? Let’s find that out. It’s hard to believe that it’s been 15 years since Cadillac bucked up and showed their true colors to the world with the original CTS-V. Since then, other V-line models have came and went, but the CTS-V remains with us as a force to truly be reckoned with. The most lovely part about it is that the CTS-V hasn’t shied away from its original formula: a rear-wheel drive, Corvette-powered, luxurious demon-spawn (although, with the rest of the world moving forward in this segment with AWD, the next generation might have to move forward as well). The CTS-V is a rip-snorter of a performance sedan, it has on-paper numbers that would make a lot of supercars whimper, let alone its competition. On the outside, it’s a handsome, yet devilish American answer to the cutting edge Germans with LEDs and other accenting in all the right places with an attractive black mesh grille replacing the previous generation’s slightly-tacky-but-not-much chrome grille. Oh, and carbon fiber...lots and lots of carbon fiber. Under that sculpted hood sits an absolute monster of an engine, a 6.2L Supercharged V8 that’s normally found at home in the Chevrolet Corvette Z06. It pumps out 640 horsepower and 630 lb ft of torque to the rear wheels through a competent 8-speed automatic. Yes, that sadly means the manual transmission that made the first and second generation so fun is gone, but don’t put down your checkbooks just yet, as it still manages a 0-60 time of 3.6 seconds. Insanity. The good stuff continues underneath, as the CTS-V of course rides on GM’s tried and true Alpha platform, the platform that made the CTS, ATS, and the new Camaro near-gods of handling, and it only helps the V. It, of course, has been firmed up a great deal to match the more raw power found under the hood. This combination is good for doing a lot of cornering, however it does feel a tad heavier in corners than a standard CTS, probably due to the extra weight under the hood. It’s nothing that really detracts from the experience however, and the platform does make for some good hoon-ability. Inside, the CTS-V has the makings of a true European competitor, but it does lack some of the fittings necessary to really make it stand out. The materials are quite nice, with tons of leather and suede across the interior and the seats, but there are some troubling plastic pieces just out of eyes reach. Also, CUE is a trainwreck, though I do find myself more used to it now than I used to be, as I didn’t find myself tearing my hair out every time I touched the dashboard. Fans of Cadillac (including myself) can rest assured that the CTS-V puts up a real fight in the mid-sized super sedan world, pushing a blow that not many can match. However, the American way does have its faults...and that’s where the Germans usually come in to pick up the pieces. Pros: It’s a wagon, interior fittings are miles ahead of the CTS-V, Quattro is still a world-winner. Cons: Suffers from Audi sameface syndrome, notable AWD understeer is an issue. Price: More than you can afford pal...black market. The Audi RS6 has been nothing but a sob story for the American enthusiast as of the past ten or so years. For those of you who don’t know, Audi decided that the RS6 was no use for the American market after the phenomenal C5 model’s end in 2003. So, we’ve been left staring from afar as you all enjoyed your previous generation’s monstrous V10 and this current generation’s wagon-only lifestyle. I decided it was no more, I was going to determine once and for all if we’re really suffering or not. On the outside, the RS6 story is as it’s always been: a sleeper. An untrained eye could definitely mistake this for a regular A6 TDI Avant with some nice wheels, or something similar. You get a nice, tidy package that would look at home in any suburban mom’s driveway. But it all radically changes when you get down and into the details. Or, does it? Let’s break it down. This generation of RS6 unfortunately lost its V10 that it had prior, and although it replaced it with a potentially fire-breathing 4.0L twin-turbo V8, it unfortunately suffered a loss of approximately 17 horsepower, from 570 to 553. 553 is still a highly respectable number, but in comparison to what came before and the CTS-V, it seems a bit old-fashioned. However the RS6 has one crucial ace up its sleeve: quattro. The crown jewel of Audi’s vorsprung durch technik, or whatever, is still running strong in its latest form underneath this shaggin wagon. This helps the RS6 get over its handicap, as planting your foot on the pedal greets you with warp-speed style launch capability, piloting the RS6 to 60 in around 3.5 seconds, only .02 slower than the CTS-V, which is impressive considering the power gap. But, quattro does come with its downfalls; while cornering in this car is impressive for the size and weight, the AWD system does present some of the usual understeer you’d might expect, but like the CTS-V it’s not enough to completely ruin the experience. Behind the wheel, you find yourself in a meticulously designed cockpit that shows what the Germans do best. There’s no annoying rubberized plastic anywhere to be found. The design is attractive, and while the floating screen is a bit tacky, it does present an infotainment system that’s actually usable and you can live with. This is definitely a nice place to be. The RS6 definitely seems to be ill-set to be compared with the CTS-V and some others in the segment, but it does have its few qualities that definitely makes it seem like the better buy of the pack. Where else can you find this speed with such practicality? And that leads me to the verdict...and I have to give it...a tie. 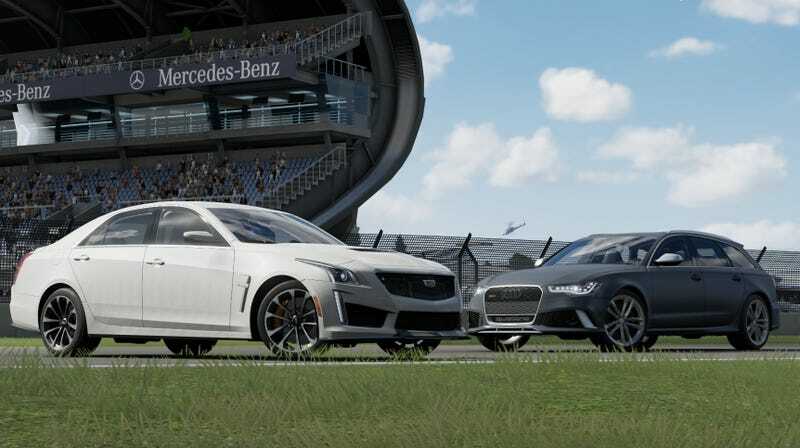 Both of these cars seem huge leaps apart from each other in every single area, and when you find a single crack on the surface, such as CUE in the Cadillac or the power loss in the RS6, it makes up for it in some other way. It’s honestly too close to call in this one...it’s your decision in the end.